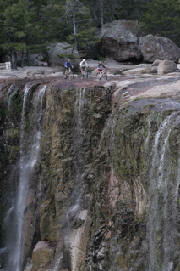 We have just concluded the latest Hans Rey adventure to Copper Canyon in Northern Mexico. Our mission was to be the first to ride mountain bikes on the technical and difficult Chinivo Trail to the heart of the canyon, the old mining town of Batopilas. March 25th 2005: After a short night of sleep in Chihuahua we were heading in the early morning to the El Pacifico railroad station to catch ‘El Chepe’, the 2nd class train that would take us after a 6,5 hour ride to the town of Creel. We stayed at a rustic lodge without electricity. That afternoon we went for a short mountain bike ride to a beautiful waterfall and a place called valley of the monks with big rock formations, to get acclimated at 7,600 feet. 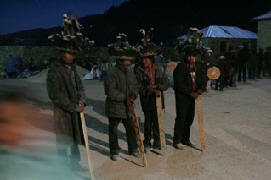 Then we got ready for the Semana Santa (Easter) celebrations of the Tarahumara which started that evening. These Indians still live in small huts and cave dwellings in their primitive and traditional ways in remote valleys, completely isolated from modern civilization. Copper Canyon is a majestic chasm in the earth that is four times larger than the Grand Canyon and close to 1,100 feet deeper. After the Spaniards had invaded Mexico, the missionaries introduced Christianity to the Tarahumara in the 17th Century, who still speak their own language today. A couple centuries later the converted Indians stopped their Christian believes which were forced on them, but kept some of the traditions such as the annual Easter Celebrations, were they dance all night in colorful costumes, play drums and march in teams through their villages practicing strange rituals. Ultimately, the next morning, after ‘partying’ and drinking a homemade corn liquor all night long, they kill and burn a statue that symbolizes Judas, who they believe was the cause of Jesus’ crucification. This must have been one of the most bizarre experiences I’ve ever had in my life. It was spooky and mysterious, very little language was spoken, it was an organized chaos, and we were the only spectators. I felt like Crocodile Dundee in New York. The following morning when we came back to watch the conclusion of the the festivities, we rode our bikes to the nearby Indian settlement and I contributed to the celebrations with a little trials riding exhibition. That afternoon we transfered to Samachique at the rim of the canyon, were we met two wranglers with our mules and donkeys and set up camp for the night. After a chilly night, we warmed up at a campfire and started our biking adventure. The Chinivo Trail, has not been used very frequently since the gold and silver rush some 150 years ago. We were hoping to make it in 3 days to the old mining town of Batopilas at the bottom of the canyon, some 6,100 feet below and 60 km later. Although the majority of our ride would be downhill on singletrail, we first had to ride uphill on logging roads, after lunch the trail turned into a very technical singletrail. There were several sections were we had to push and carry our bikes uphill. The terrain was steep; loose rocks and try air didn’t make things any easier. Our pace was rather slow due to our convoy and the difficulty of the trail. We didn’t reach our goal of that day, and had to stop short to make camp and find a suitable place for the pack animals. We slept without tents under the open sky. The next day had lots of fun trail riding in store for us, but it also turned into an 11 hour day on bikes. One of the hardest things on these trips is that it takes extra time, in order to document everything on film we have to always wait for the camera team and photographer to catch up and set up. We crossed several remote Indian settlements, although they are not really used to many strangers in this particular area, the Indians would mind their own business and keep to themselves in a rather shy way, except for the children, who would greet us and run with us for a while. April did really well on the trip, although I knew she was one of the best downhill racers in the world, I wasn’t sure how good she would do on the really ‘trialsy’ terrain and steep riding sections, especially since we were the first who ever attempted this route on bikes. Brian was really consistent, and proofed once again that he is a master of any situation and one of the best and fittest in the world. In the technical sections we had little ride-off competitions to see who could make it further without putting their feet down. We came to the conclusion that he’d do better at anything that could be mastered with some speed and momentum and that I would do better in the super slow trials sections. Brian had a little crash and cut his knee, as he high-sided off the trail, he was ok and after a short stop we continued. We met Antonio, a local Tarahumara runner. 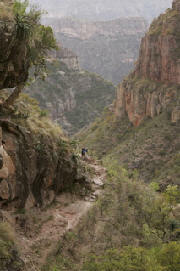 The Tarahumara’s are known to be amongst the best off-road trail runners in the world. Several years ago he was invited along with some other Tarahumaras to run in the notorious Leadville 100 Mile race, all 7 of them finished in the top ten – wearing sandals. He was still sporting his “Under 30 Hours” Leadville belt buckle, he finished Third that year, it took him 24 hours. Antonio came with us for a few hours to make sure we didn’t loose track of the trail, which at that point, wasn’t always obvious. We had to made up time and ground, since we had fallen behind on the first day, and the only suitable grazing and water spot for the donkeys was a long way ahead of us according to the wranglers. The camera-team had the hardest job, they struggled to keep up with their heavy cameras, Patrick had a inflamed knee and April still had a bad cough. Things were not going too smooth, although we passed through some of the most amazing countryside. The canyon opened up more and more, the views were magnificent. The landscape changed a lot from pine forests to big rock slabs to desert style spree. It reminded me sometimes of the Sierras of Central California and also the Arizona desert. At 4 p.m. that day we were still over 2 hours away from our campsite and were already 9 hours in the saddle, I was already out of water and the sun was setting fast. We started to loose concentration and got tired, which was quite dangerous considering we were riding along a rocky trail with a 600 feet drop on one side. This was my favorite part of the trip, I knew the adventure had started when the going got tough. We finally reached camp near the village of Chinivo, right as it got dark. We ate some of Arturo’s good pasta, filtered some water, and went to sleep. Patrick woke up in the morning with some mysterious, blood-filled ticks in his tent; they were the size of stinkbugs. It was very scary, since they looked like the same deadly bugs they have in South America, which can cause amongst other things uncureable heart problems. Arturo, the Indians, the wranglers and even the local doctor at the end of our trip had all different horrifying and unsatisfying answers; and only confirmed that this ‘Chagas’ bug indeed exists, but that further blood tests need to be done to determine if these ones carried the dangerous decease. We continued our journey on really cool downhill trails for several hours, until we got near the bottom of the canyon to the small village of Munerachi, which consists of about 15 houses and an old church. It felt like a old Wild West ghost town and I felt like “Billy the kid’ when we rode our ‘iron horses’ down the main street. After a short break we continued along a river trail for about 8 km to the next town of Cero Colorado. This old mining village was a little bit bigger and has 4X4 access by dirt road since recent years. A old miner showed us his mining mill which he still uses nowadays, in a labor intensive way to wash for gold. After lunch we were off for the final stretch of our trip, we joined the legendary Camino Real trail, which was built by the Spaniards and was the main road between Mexico City and Santa Fe, NM. Some of the original cobble stone was still intact, and didn’t make the riding any smoother, our 5-6 inch full suspension bikes proofed to be a good choice. Part of the trail lead along the old aqua-duct the miners had built and the Indians are still using today. After another long day it was great to make it to our final destination and reach the old mining capital of Batopilas, which is a beautiful town in the heart of Copper Canyon. We were all happy to take a bath, sleep in a bed and taste some local tequila. The riding was superb and good. 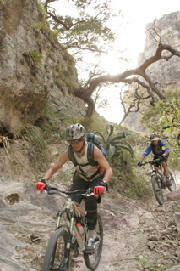 Copper Canyon has definitely lots to offer for mountain bikers, and has many other routes to choose from. All of us will remember this great experience and cherish the memories.